Since we are pretending Sunday didn’t happen, I decided to take Monday off as well. Let’s call it a “personal day”. Scores are a bit late but seeing as everyone was focused on the game that didn’t happen Sunday evening, I figured none of you would care. Just as predicted, Kentucky & Syracuse both won with ease. #3 Ohio State beat #20 Wisconsin by 6 points in a tough battle where Sullinger had to drop 24 points and grab 10 boards in order to hold on. Unfortunately, my other prediction was wrong… barely. #8 Kansas was unable to upset #4 Missouri because they decided to heave up a contested 3 pointer with 3 seconds left rather than kicking it to the wide open 3 man for a clear shot. Anyways, there was some good in the weekend (on the basketball court, not football field). 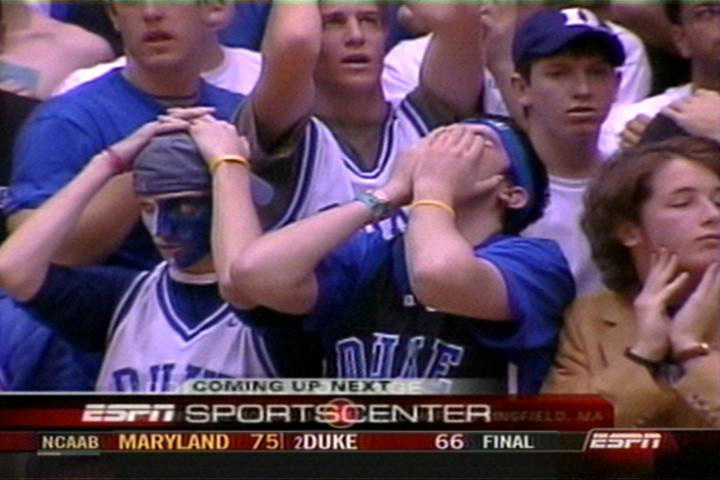 #5 Duke was upset by Miami. HA. #10 Michigan State was able to beat #22 Michigan by 10 points in an in-state rivalry game. If only I could pick my bets as well as I pick these games. Since it’s a day late, we also know this week’s rankings so here is the top 5. This entry was posted in College and tagged basketball, duke, kansas, kentucky, missouri, mizzou, NCAA, Ohio State, rankings, sullinger by christoph131. Bookmark the permalink.